The city of 52 gates, Aurangabad is the gateway to the age-old heritage of Ajanta and Ellora Caves. Besides this, the city is bestowed with immaculate beauty of monuments devoted to Maratha and Mughal traditions. Named on the sixth Mughal Emperor, Aurangzeb, the city served as capital to his empire. 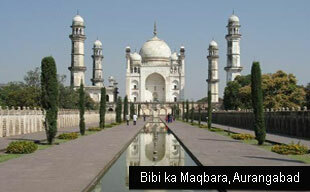 Often termed as the tourism capital of Maharashtra, Aurangabad is also famous for Bibi-ka-Maqbara, a replica of Taj in Deccan region. The tomb of Rabia Daurani - Bibi ka Maqbara was built in memory of Emperor Aurangzeb's wife by their son, Azam Shah in 1679 as a loving tribute to his mother. Even though it looks like an imitation of the Taj Mahal, it represents the shift of mighty Mughal architecture of Akbar and Shahjehan to the simple planning of later Mughals. Undermined for its adaptation, still this mausoleum and the surrounding gardens are well worth a visit. The city of fortunes, Daulatabad mostly is known for the footprints of Tughlaq Dynasty. Built by the 14th century Delhi Sultanate’s Emperor, Muhammad Tughlaq, the city dwells around a formidable hill-top fortress. The unique features of Daulatabad consist of a 5 km walk, soaring 60 mts Chand Minar, Chini Mahal & the famous 6 meter cannon of Aurangzeb, cast from 5 different metals. The world heritage sites of Ajanta and Ellora Caves depict an era of magnificence where magical frescoes and sculptures adorned the caves and different temples in an arc. Ajanta Caves contain a series of sublime tempera paintings which survived the test of time. Almost 2200 year old, the caves boast of the best ever frescoes belonging to India. On the other hand, Ellora Caves showcase the brilliance of rock cut cave architecture, uniting the Hindu, Buddhist and Jain beliefs together in one cave complex. The everlasting art sculpted on rock cut facades portray the immaculate combine of calmness and contrasting drama, portraying incidents and scenes belonging to different mythologies. This lesser known cave complex in Aurangabad is dedicated to Buddhist beliefs. These 12 artificial rock-cut Buddhist shrines are located on a hill. 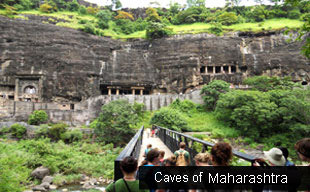 The earliest reference of these caves is cited in the Kanheri Chaitya. Carved out of soft basalt rock during 6th and 7th century, the cave complex is often compared to its neighbourhood cave complex, Ajanta in terms of retaining Indian classical art trend. Climate - Aurangabad feels awesome in winter months, i.e. October to March when the climate is affable to deal with. By Air: The airport is 10 kms east of the city. By Road: Pune is six hours, Nasik is five hours overnight journey to Indore or Mumbai. By Railways: The two direct trains from Aurangabad link Mumbai (375 kms) & Manmad (113 kms). Pune- Being in Pune gives a traveller, a serene, cool and calm experience. Often referred to as the cultural capital of Maharashtra, this city is historically associated with the glory of this Maratha land. Just six hour drive away from Aurangabad, this city forms an inevitable heartland of the state. Present day Pune is often compared to Oxford, for the city is a hub of world class educational organisations and institutes.